Is It Good? 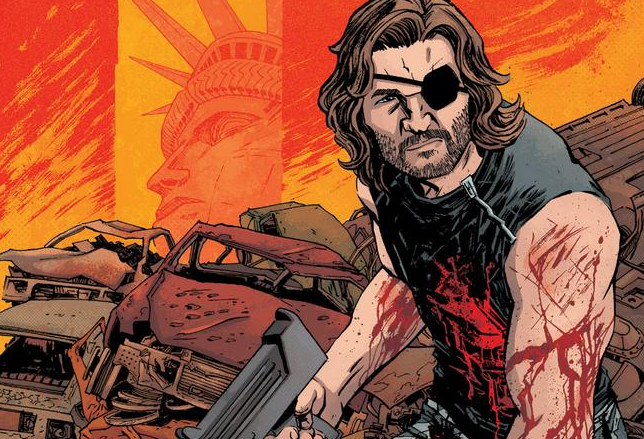 Escape from New York #2 Review – AiPT! Snake Plissken has made it to the ”free” Republic of Florida, where he has his first run-in with the twin gods running the state. Is it good? Escape from New York #2 is your typical thirty page comic book, but it feels a lot longer. The main reason is the sheer amount of dialogue that occurs within the book. Many of the panels have so much dialogue it takes up over half the panel! Chris Sebela offers an interesting critique on the meaning of freedom. The twins who rule the “free” Republic of Florida let their citizens do what they want as long as they serve in their military and are not traitors to Florida. Hell, Sebela takes it a step further when the twins negotiate with Snake out of the barrel of a gun. He is free to say “No,” but they are free to put a bunch of holes in his chest. It is a very intriguing discussion Sebela sparks that takes up the first third of the book. Diego Barreto is unleashed on an action sequence involving a mix of Bam Bam, Pebbles, the hair of Blanka from Street Fighter, and fishnet leggings. Meemaw is quite a terrifying figure. The action sequence is a little hard to follow and there is one horrendous panel depicting the point of view from between Meemaw’s legs — something that will forever be ingrained in my mind and will most likely give me nightmares. To make matters even worse, Ed Dukeshire decides to add some sound effects in the most inopportune location. All that “beauty”… and she speaks in the third person to boot. What a catch. The middle third of the book continues the discussion Sebela started in the first third about what freedom is/isn’t. Snake finds himself stuck in a submarine at the bottom of the ocean where the twins hold those who decided not to cooperate with their orders as prisoners, but the prisoners operate in a similar fashion to the world outside the sub. The strong beat down the weak and lead pipes are used to connect the weak’s skulls together rather than function as proper plumbing piping. Sebela brings the theme of freedom full circle in the final third. Snake finds himself the victim of hospitality from a bunch of folks who have eluded the twins’ control and he faces a decision whether to take responsibility for the decisions he has made and those who have aided him. The decision inevitably leads to an action sequence, where Barreto is able to be a tad innovative with an ambush. This final battle sequence also portrays the horror of war with both sides taking numerous casualties in a very gruesome manner with men’s faces being blown off.